Some projects take months to plan and prepare before knitting. Some take years to get around to, even though they’re good ideas. And then sometimes, a project jumps up out of nowhere and demands to be knit. I finished spinning the yellow-brown fiber last week, and set the twist in the yarn this weekend. It’s been whispering that it wants to be a shawl, but I still couldn’t tell if the colors would “go” together, so I decided to swatch a bit on Sunday. 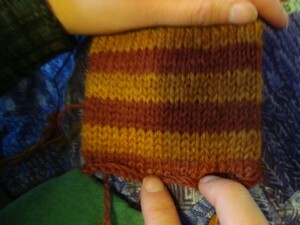 This picture is a little dark, but the swatch said that yes, the two colors would work together. Still, the combination seemed a little flat. 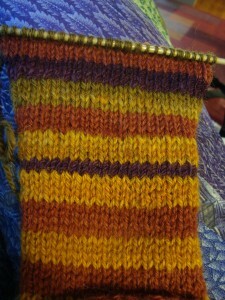 The variegation in the yellow-brown would help to liven things up a little bit, but it just didn’t quite pop yet. The yarn had been sitting in my knitting basket on top of the lace ribs sweater, and the mixture of the gold and mahogany with purple kept catching my eye. So, I went looking in the stash. 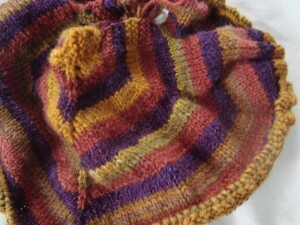 I added in a narrower stripe of some spindle-spun yarn that I dyed just before we left Seattle and spun in Germany. It’s a tighter twist, but other than that the gauge is pretty similar. The purple really brings out the pink in the mahogany, doesn’t it? 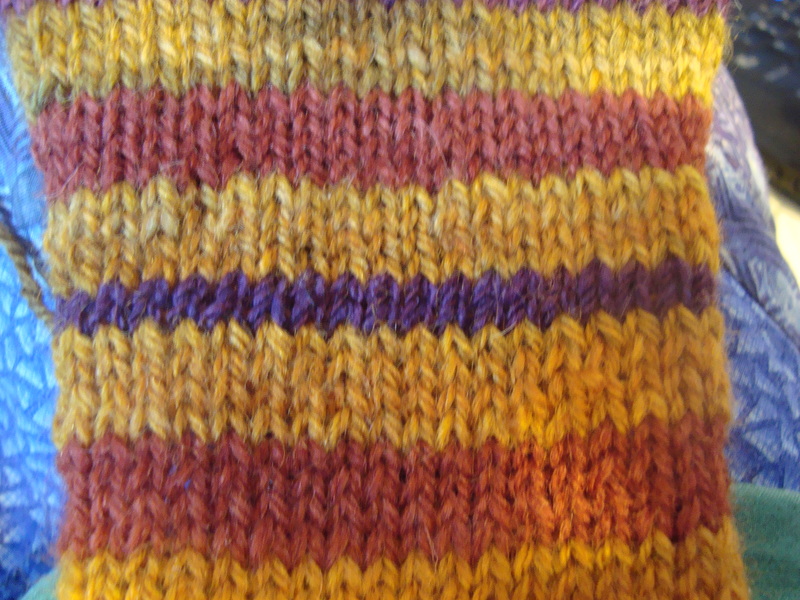 Even so, I felt like the purple was too dominant in the knitting, so I decided to change the stripe pattern so that I wasn’t putting the dark purple in the middle of the light yellow-brown. I also tried widening the stripe so it didn’t interrupt the rhythm of the color changes. 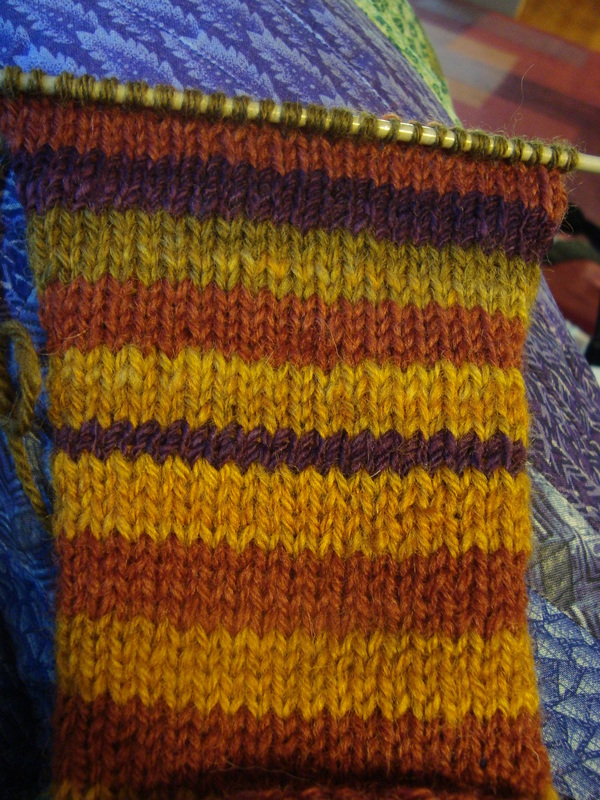 That looked a lot better, and I really liked the purple next to the greenish stripe where the variegated yarn is beginning to change colors, so I cast on. The shawl itself is actually a remake of an old idea. This stockinette lace shawl served as my bus knitting for several months last summer, though I think it hardly (if ever) got a mention on the blog. The yarn is Knit Picks Bare laceweight that I dyed with logwood in a natural dye workshop in Madison. The project stalled for lots of reasons. 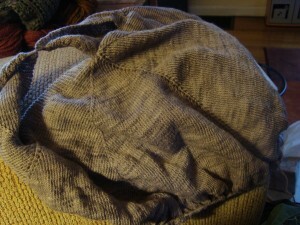 First, it was taking me 3 20-minute bus rides to knit a single row (I’d guess that I’m well over 1000 stitches per row). Second, while I love the color of the yarn, it unfortunately came out a little coarse from the dyeing process. I think we probably used too much mordant, which can dry out the fiber. Dry yarn is just not as much fun to knit, and the color leaks a tiny bit while I knit, giving me slightly sticky purple fingers over time. Third – and this is the real reason it’s been sitting in a closet for a year – I need to make a decision. I’m at the point where I could bind off and be done. I have vague notions of wanting a lace edging to finish off the piece, but haven’t quite found the right one. I also hate to bind now off without finishing off the skein, but it’s an 800-yard skein, so there’s quite a bit left to go before I run out of yarn. And so it sits. I don’t usually let UFOs hang around very long; there are maybe 3 or 4 projects in my closet that are languishing and not just frogged. But this one has a lot of potential. I love the color, I like the design quite a bit, and it’s really close to done. It’s one of those rare projects that I have given up on for the time being, but am actually pretty sure that I will return to it later. In the meantime, I really want to play with that design. It’s a simple shawl, begun like a triangle, but then I have added extra increase sections as you knit to make it curve around (kind of a golden spiral kind of idea). It looks like a shapeless blob sitting there on the arm of the couch, but when I hold it up to look at it, I really like the shaping and think it will make for a really comfortable shawl to wear. And this new yarn is volunteering to become a new version. I had forgotten about the purple shawl, but the idea has been tugging away at the back of my mind ever since I started spinning the yellow-brown to go with the mahogany. This yarn is a much heavier weight, so it will knit up faster, and the stripe pattern will take away all need for fancy edgings. Just plain and simple stockinette, but with color changes to keep me interested and a heavier gauge so that it doesn’t require 800 yards to knit. Sounds like a good deal. I knit on it last night at knitting group, and it’s getting pretty big already. So big, in fact, that I can’t even lay it out to show you the shape. I’ll have to put it on a second pair of needles later so that I can take a picture of it all laid out. The rows are getting longer (and longer) but I really like the colors together, and so far it’s knitting up really fast. And I kinda can’t stop knitting on it. Fingers crossed that the second version finishes faster than the first! Funny how something can just jump out a you like that. The concept for the shawl sounds really intriguing. I can’t wait to see how it works out! Absolutely loving the colors in the shawl! They are working great together! When I used to do some picture framing I was always getting critiqued for my choice of matt colors — until the project was finished. Then the same people would ooh and ah over how the picture (or object d’art) was perfectly set off by my choices. They couldn’t see the potential for unusual combinations. Needless to say, you can…and that pop of purply-blue is exactly what was needed! DesigKnit is powered by	WordPress 4.8.9 . Page generated in 0.280 seconds using 38 queries.